Emerge Energy Services LP (EMES) Making Money Out Of Sand? Emerge Energy Services LP stock deep analysis on five-year historical data. Emerge Energy Services LP’s stock has fallen since the announcement of dividend suspension in October 2015. The lowest stock price was on October 27, 2015, at $3.87 per share. Because of economic slowdown, the oil and gas industry has suffered a setback and so the frackers. Consequently, if the oil industry recovers, the frackers will progress again. Although Emerge is generating more revenue year over year, the company’s debt is also increasing year over year. Emerge is using borrowed funds more than the investor’s investment for their business operations. Furthermore, the company’s cash and cash equivalent represents 1.5 percent of the total assets. First of all, the company’s liquidity is a concern and the question asked, “Would Emerge be able to pay its obligations in due date in the future? The balance sheet shows that Emerge has good liquidity ratios hence, it has a sound balance sheet. The income statement has not seen any negative earnings from 2012 to 2014. Emerge Energy Services LP has an incredible yield of 73.96 percent and also payout ratio of 432.4 percent. As a result, the valuation shows that Emerge is worth a lot more than its current market price today. Probably, this is the right time to buy. Let’s find out. As a result of fracking, Emerge is involved in a legal dispute. They use hydraulic fracturing or fracking to extract oil and natural gas from deep under the earth. Hydraulic fracturing or fracking is the process of drilling and injecting fluid into the ground at high pressure in order to fracture shale rocks to release natural gas inside. Furthermore, the environmentalist believed that this process creates environmental and also health risks. The fracking process could be dangerous to the environment and therefore, may contribute to health risks within the community. The process may affect groundwater and rather can cause pollution hazards according to the book, “What’s the fracking problem? Hydraulic fracturing, silica sand, and issues of regulation”, page 639. On the other hand, although, the extraction of the silica sand can provide employment and also has economic benefits. To the site. Each gas well requires an average of 400 tanker trucks to carry water and supplies to and from the site. Heavy Load. It takes 1 to 8 million gallons of water to complete each fracturing job. Fracturing Fluid. Up to 600 chemicals are used in fracking fluid, including carcinogens and also toxins such as uranium, mercury, ethylene glycol, methanol, hydrochloric acid and also formaldehyde. Down 10,000ft, the fracking fluid is then pressure injected into the ground through a drilled pipeline. = 72 trillion gallons of water and 360 billion gallons of chemicals that are needed to run the current gas wells. Shale fracturing. The mixture reaches the end of the well where the high pressure causes the nearby shale rock to crack, hence creating fissures where natural gas flows into the well. Contamination. During this process, methane gas and toxic chemicals leach out from the system and therefore contaminate nearby groundwater. Furthermore, Methane concentration is 17 times higher in drinking water wells near fracturing sites than in normal wells. Drinking Water. Contaminated drinking water is used for drinking water for nearby cities and towns. In addition, there have been over 1,000 documented cases of water contamination next to areas of gas drilling and also cases of sensory, respiratory and neurological damage due to ingested contaminated water. Left Behind. Only 30-50 percent of the fracturing fluid is recovered, while the rest of the toxic fluid is left in the ground and is not biodegradable. The waste fluid is left in the open air pits to evaporate, releasing harmful VOC’s (volatile organic compounds) into the atmosphere, hence creating contaminated air, acid rain, and ground-level ozone. In the end, hydraulic fracking produces approximately 300,000 barrels of natural gas a day, but at a price of numerous environment, safety, and health hazards. “We adhere to a strict occupational health program aimed at controlling exposure to silica dust, which includes dust sampling, a respiratory protection program, medical surveillance, training, and other components. We designed our safety program to ensure compliance with the standards of our Occupational Health and Safety Manual and U.S. Federal Mine Safety and Health Administration (“MSHA”) regulations. For both health and safety issues, extensive training is provided to employees. We have organized safety committees at our plants made up of both salaried and hourly employees. We perform annual internal health and safety audits and conduct semi-annual crisis management drills to test our abilities to respond to various situations. Our corporate health and safety department administers the health and safety programs with the assistance of plant environmental, health and safety coordinators”. Source: SEC Annual filings 2014. Emerge Energy Services LP (Emerge) is a Delaware limited partnership. The company was formed by Insight Equity, a private company based in Southlake, Texas in 2012. In addition, Insight Equity managed a portfolio of companies that own more than $800 million capital. Furthermore, Emerge Energy Services LP is the leading manufacturer of Northern White Silica Sand. Emerge operates in fuel processing and distribution, and also the sand mining. The company wants to create a diversified portfolio of critical energy service operations. 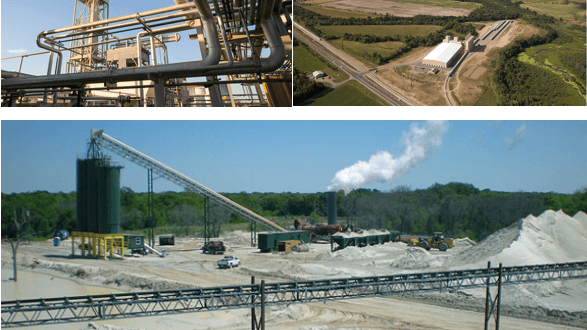 July 25, 2014, The company completed the acquisition of mineral reserves and also related assets to help manage the supply and cost of raw sand to the company’s Wisconsin sand processing plants. May 14, 2013, Emerge completed the acquisition of Direct Fuels’ net assets for $98.3 million. Direct Fuels operates a motor fuel terminal and transmit processing facility in Texas, in which it expands the company’s geographic presence in the Dallas-Fort Worth, Texas market. May 2013 Emerge Energy Services was combined with Superior Silica Sands (SSS), Allied Energy Company (AEC), and Direct Fuels (DF) in a series of transactions which developed in the initial public offering of Emerge, stated on the company’s website. 2011 SSS expanded to Wisconsin with the construction of the new Auburn facility, which provides direct access to the highest quality frac sand in the industry. 2010 The company opened a second industrial sand plant in Kosse dedicated to processing sand mined at the Kosse quarry. 2009 SSS built a new state-of-the-art processing plant at Kosse, Texas, with the support of Insight Equity. The facility has the capacity to supply over 900,000 tpy of quality proppant (frac) sand from high-quality Wisconsin feed. 2008 Insight Equity acquired Superior Silica Sand. Insight Equity acquired AEC, a wholesale distributor of renewable and petroleum-based refined products, with fuel distribution representing a majority of revenue. AEC was founded in 1962. 2003 Insight Equity acquired Direct Fuel (DF), the largest independent regional fuel distributor and specialty processor in North Texas. DF was established in 1997. The company has four major plants. Clinton, WI – located in the township Clinton, WI, directly on a second class 1 railroad, the Canadian National. New Auburn, WI – located on the Progressive Rail Short Line that connects to the Union Pacific Railroad. Kosse, Texas mine and dry plant. Arland, WI – Superior Silica Sands’ newest state-of-the-art, the all-weather facility is a close replica of Clinton, WI. On May 14, 2013, the company completed its initial public offering (IPO) and became a publicly traded partnership. The net proceeds from IPO were $116.2 million, in which the price was $16.55 per share. The company has a total of 100 employees. The business was operational since 2008. 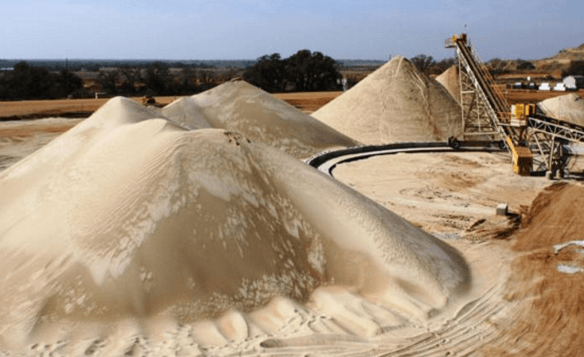 According to the company’s SEC filings, there are several factors that contributed to the increase in demand for frac sand in the past years and in the future. In addition, the increased drilling of horizontal wells over vertical and directional wells increased drilling efficiencies and also the increased use of sand per well, have forced demand for frac sand. Furthermore, the demand will remain strong in 2015 compared to 2014 as the technological technique will continue to be applied. The company expects said that the demand for frac sand will continue to grow, however, in the first half of 2015 will be a period of relative growth stagnation for the industry due to lower rig count. The sand revenue from 2013 to 2014 increased by $174.1 million or 104 percent, as a result of a 62 percent increase in total volumes sold. The company has a lower cost of goods sold which consist primarily of direct costs. In addition, the cost of goods sold is the purchase of sand, transportation to the plant to trans-load facilities, mining processing costs, plant wages and also repairs and maintenance. Frac sand production facilities as of December 31, 2014. The wet plant shows the proven recoverable reserves in millions of tons. Emerge reserves will supply them with 15 years of Northern white frac sand and 17 years of native Texas sand, according to the annual financial statement filed with SEC. Furthermore, Emerge own 100 percent of their mineral reserves in Texas and 6.6 percent in Wisconsin, with the remainder of the reserves. Emerge leases from third-party landowners with leases expiring in different times between 2036 to 2038. In addition, as of December 31, 2014, the mineral reserves under the property, plant, and equipment was $30.18 million. The table above presents the production report of Emerge as of December 31, 2014, on its wet and dry plant locations. Furthermore, the report also shows the plant capacity and the production volumes in thousands of tons. Insight Equity has 7.2 million common units ownership. Another, Goldman Sachs Asset Management LP has 3.0 million common units ownership. Susquehanna Financial Group LP has 1.3 million common units ownership. Also, Ted W. Beneski has 563 million common units ownership. In addition, all directors and officers as a group of 11 persons have 8 million common units ownership. The controlling equity owners of Insight Equity were Ted W. Beneski and Victor Vescovo. In addition, Insight Equity has 30.2 percent equivalent ownership. Goldman Sachs Asset Management, LP has shared voting power and also shared dispositive power with respect to 3,011,858 units. In addition, the company has 12.7 percent equivalent ownership. Susquehanna Financial Group, LLLP has shared voting and also shared the dispositive power of 1,340,225 units. Another, the company has 5.7 percent equivalent ownership. Out of Ted Beneski’s beneficial ownership, 27,522 units are held in an irrevocable trust account in favor of his sons, in which he is the trustee of each trust account. 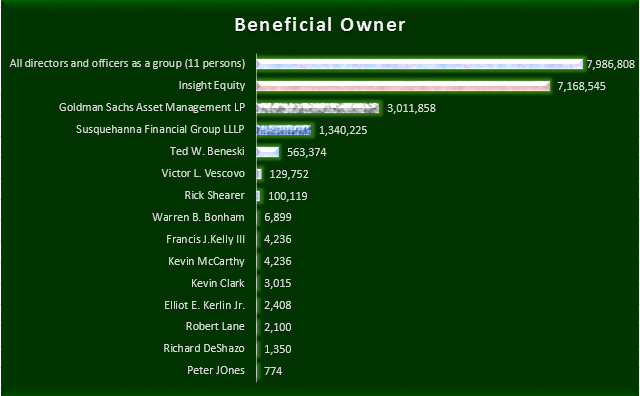 In addition, Ted Beneski has 2.4 percent equivalent ownership. Kevin McCarthy’s ownership includes unvested restricted units granted to the company’s independent directors. In addition, McCarthy has less than 1 percent ownership. The percentage of units beneficially owned is based on a total 23,718,961 common units outstanding as of the Ownership Reference Date as stated in the company’s SEC Filings. How the company makes money? Emerge Energy Services LP is a diversified energy services company. The sand subsidiary of Emerge produces silica sand that is a key input for the hydraulic fracturing of oil and gas wells. Furthermore, the company’s sand facilities are located in New Auburn, WI, Barron County, WI, and Kosse, TX, with headquarters in Fort Worth, TX. Silica sand and also fuel segment. 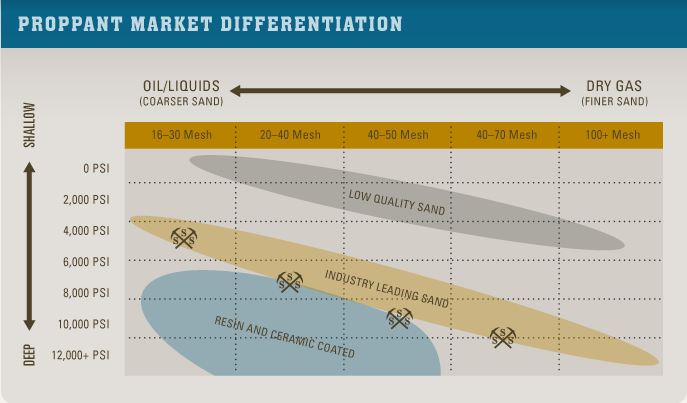 The image above presents how the superior silica sand is the leading supplier of the highest quality frac sand available in North America. The image above presents the forecasted historical demand trend for Proppant and Raw Frac Sand in the United States. Furthermore, the factors that drive the demand for frac sand is the level of horizontal drilling activity by exploration and production companies and also the level of hydraulic fracturing services. Who is running the business? Mr. Rick Shearer was elected by the General Partners as the Chief Executive Officer in April 2012. In addition, on May 2014, he was appointed to the Board of Directors of General Partner. Masters of Business Administration degree from Eastern Michigan University. A graduate of the Executive Management Program at Harvard University. What did Mr. Rick Shearer work in the past and leading up to the present position? Present Chairman of the Board of Black Bull Resources. May 2010 to Present He served as President and Chief Executive Officer of SSS. March 2007 to May 2010 President and Chief Executive Officer of Black Bull Resources, an entity that specializes in the mining, processing, and marketing of industrial minerals, a publicly traded company on the TSX Venture Exchange. January 2004 to March 2007 Member of the Board of Directors of Excell Minerals, a global stainless steel metals recovery company based in Pittsburgh, Pennsylvania, prior to its acquisition by Harsco Corporation in February 2007. August 1997 to January 2004 President and Chief Operating Officer of US Silica Company Inc., a silica sand supplier. 2003 to 2004 Founding Chairman of the Industrial Minerals Association of North America. Vice Chairman of the National Industrial Sand Association of Europe. May 2015 to Present Served as Chief Financial Officer at Emerge Energy Services LP. 2001 to December 2007 He was Chief Financial Officer of Comsys IT Partners, Inc., an IT staffing company and an affiliate of Metamor. 1997 to 2001 Served as Senior Vice President of Business Operations for Metamor Worldwide, Inc., an IT services company listed on NASDAQ. The total revenue was $377 million in 2011 and year over year it is increasing at a rate of 27 percent. In addition, the growth rate is 194 percent at $1.1 billion in five years. The total key executive compensation was $812 thousand, $17.7 million and $3.6 million in 2012, 2013 and 2014, respectively. Rick Shearer, CEO has a total compensation of $455.6 thousand, $14 billion and $1.4 billion in 2012, 2013 and 2014, respectively. Robert Lane, former CFO has a total compensation of $81.7 thousand, $431 thousand and $1.2 million in 2012, 2013 and 2014, respectively. 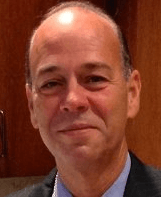 Richard Deshazo has $560 thousand total compensation in 2014. Warren Bonham, VP has a total compensation of $274.6 thousand, $3.3 million and $439 thousand in 2012, 2013 and 2014, respectively. Emerge total revenue was trending up, however, its costs of revenue were averaging 90 percent. Based on net income, the total executive compensation was 4.72, 50.46 and 4.05 percent in 2012, 2013 and 2014, respectively. The total compensation of Robert Lane based on net income were 0.47, 1.23 and 1.38 percent in 2012, 2013 and 2014, respectively. Compensation of Richard Deshazo was 0.63 percent in 2014. Warren Bonham has the compensation of 1.60, 9.43 and 0.49 percent in 2012, 2013 and 2014, respectively. Rick Shearer’s compensation based on net income was 2.65, 39.80 and 1.54 percent in 2012, 2013 and 2014, respectively. Emerge is capable of generating more revenue year over year, however, the cost of revenue was high and the bottom line was below 10 percent, hence 5, 50 and 4 percent were distributed as compensation. 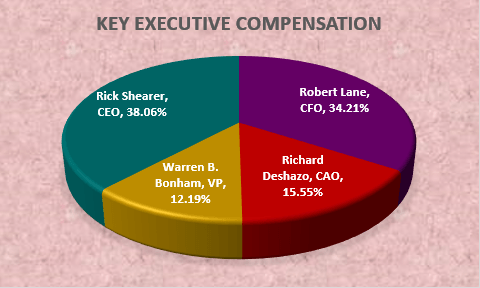 The graph below presents the distribution of the total key executive compensation in 2014. 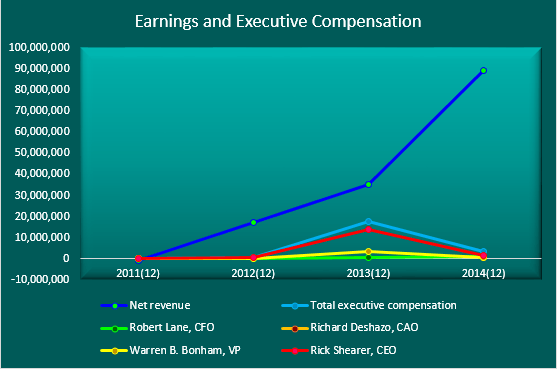 The graph presents the three years historical key executive compensation. In 2013, the company paid a higher compensation to the key executives compared to 2012 and 2014. Rick Shearer has a total compensation equivalent to 56.1, 78.9 and 38.1 percent in 2012, 2013 and 2014 percent, respectively. Warren Bonham has a total compensation equivalent to 33.8, 8.7 and 12.2 percent in 2012, 2013 and 2014, respectively. Richard Deshazo has a total compensation equivalent to 15.5 percent in 2014. Robert Lane has a total compensation equivalent to 10, 2.4 and 34.2 percent in 2012, 2013 and 2014, respectively. Rick Shearer’s basic salary were $245, $313 and $425 thousand in 2012, 2013 and 2014, respectively. Robert Lane’s basic salary were $34, $256 and $270,6 thousand in 2012, 2013 and 2914, respectively. Richard Deshazo’s basic salary is $234,000 in 2014. Warren Bonham’s basic salary were $150, $137 and $200 thousand in 2012, 2013 and 2014, respectively. Finally, the basic salary of the executives was approximately 50 percent of their total compensation and the remaining percentage were non-equity compensation. 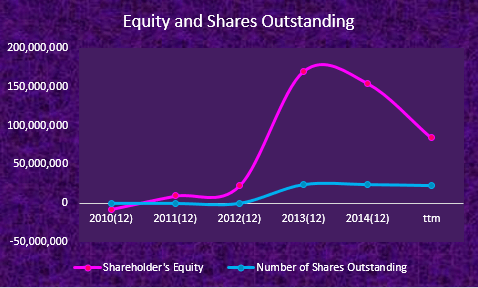 The graph presents the historical partners’ equity and also the share outstanding of Emerge. From 2010 to 2012, the partner’s equity was increasing yearly up to $20 million. On the date of IPO in 2013, the partners’ equity soared to $170 million at approximately 650 percent. In 2014 and the trailing twelve months the partners’ equity decreased by 9 and 46 percent, respectively. The number of shares outstanding from 2010 to 2012 was zero since the company IPO was in 2013. As a result of Emerge IPO in May 2013 the net proceeds was $116.2 million and also non-recurring charges of $11 million. Furthermore, Emerge had a secondary offering made on June 2, 2014, with 3,515,388 common units at a price of $109.06 per common unit. The net income of $13,1 million from January 1, 2013, to May 13, 2013, was added to the total partners’ equity resulting to an increase in 2013. Another reason for an increase in equity is the income of $22,0 million from May 14, 2013, to December 31, 2013. A further reason for an increase in the proceeds from IPO, net of offering costs of $116.2 million in 2013. Common units issued for the business acquired of $53.7 million was also added to the total partners’ equity in 2013. therefore the equity increase. Distribution payments were deducted in the total partners’ equity in 2013 at $49.5 million, as a result, the total decreases. A net income of $89.1 million in 2014 was added to the total partners’ equity, therefore the equity increase. Equity-based compensation of $9.2 million in 2014 was added to the total partners’ equity. Total distributions of $113.8 were deducted from the total partners’ equity in 2014, so the total decreased. In 2013, the total partners’ equity had increased by 650 percent because of the proceeds from IPO and also the company’s net income. The partners’ equity decreased in 2014 due to significant distribution payments made, and yet the net income was added. The graph above presents the historical cash flows of Emerge Energy Services LP from 2011 to the trailing twelve months presented in a graph. In addition, this graph will show us the trend of cash generated and used year-over-year. 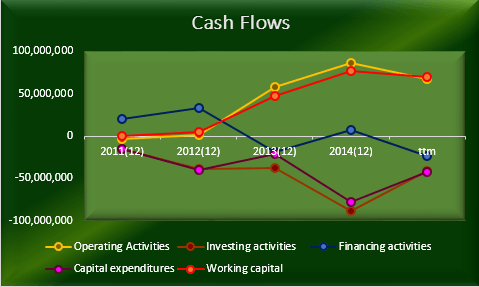 The operating cash flows were positive and also increasing year over year from 2011 to 2014. And, the cash from investing activities was negative due to investments. Also, the cash provided by financing activities was positive due to debt issued. Cash flow from operating activities is the money that the company brings in for the regular business activities. Investing activities show the changes as a result of gains and losses in investments. In addition, the purchases of property, plant, and equipment at $77,884,000 and also the business acquisition at $11 million is significant. Financing activities show the external activities of the company. Also, Emerge has proceeded from the line of credit borrowings of $371,657,000. In addition, there was a repayment of the line of credit borrowings of $243,603,000 in 2014. Furthermore, Emerge also has a distribution to unitholders at $113 million and payment of capital lease obligations at $5.8 million also, payments of financing costs at $2.3 million in 2014. Emerge has a significant amount of purchases of properties and acquisitions in 2014. In addition, the company is also using the proceeds from the line of credit borrowings in financing activities. Furthermore, Emerge also made repayments of the line of credit borrowings and distributions to unitholders. The book value in 5 years was $0.97. The average return on equity was 74.13. ROE ratio deteriorates 79 percent in 2015. The return in book value in 5 years was $0.72. Further, stock price in 5 years was $4.60. Another, the yield was 63 percent. Moreover, the risk used was 15 percent. Current price as of December 7, 2015, was $6.06 per share. As a result, the intrinsic value of the stock is $30.93. The stock price of Emerge is undervalued. This formula breaks the return on equity into three components, such as the net profit margin, the asset turnover, and the equity multiplier. 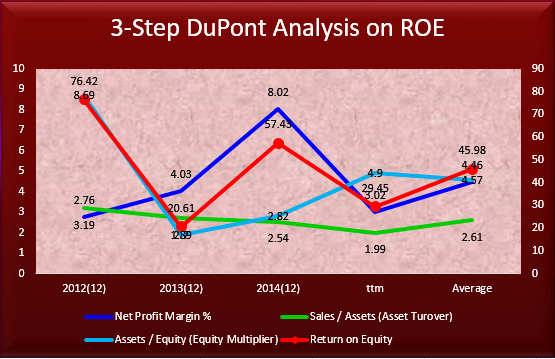 This the first step in the DuPont extended Return on Equity analysis. The return on equity is broken down into two components, the net profit margin, and also the equity turnover ratio. The net profit margin shows an upward trend from 2012 to 2014, however, in the trailing twelve months, the trend fall by more than 50 percent. Further, the net profit margin was averaging 4.45 percent, however, it has an erratic movement. Return on equity means the return on shareholders’ investment. Furthermore, the equity turnover ratio was erratic in its movement in the last 4 years, furthermore, it is averaging 12.43 percent. The equity turnover is a measure of how well a company uses its equity to generate revenue. As a result, DuPont equation provides a wider picture of the return on the company’s earnings on its equity. In addition, it tells where the company’s strength lies. Furthermore, it tells where there is room for improvements. Return on equity was erratic in movement with an average ratio of 45.98 percent. Asset turnover was averaging 2.61. Therefore, it means that EMES is generating an average of $0.26 of profit for every $1 of assets. The equity multiplier was averaging 4.57. Moreover, the return on equity was erratic in movement in the last 4 years, with an average of 45.98. ROE is broken down into three components, the net profit margin, the asset turnover, and the equity multiplier. Net profit margin is also called the bottom line profit. Asset turnover tells us how effective the company is utilizing its assets. 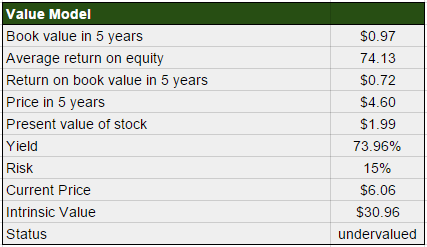 The return on equity measures on how much the shareholders earned for their investment in the company. Emerge Energy Services LP is an emerging growth company. It is worth more than its current market price today. The company has a sound balance sheet and also the income statement has not seen any negative earnings. In addition, cash from operating activities is positive in the last four years. Emerge has an incredible yield of 73.96 percent and also a payout ratio of 432.4 percent. The oil and gas industry had suffered a setback because of the economic slowdown, if the oil and gas industry recovered, frackers will be more profitable. Furthermore, the demand for silica sand will continue to rise. Therefore, the potential for growth is high for Emerge. In conclusion, the stock of Emerge Energy Services LP is best for a Buy.